Presentations will be videotaped, and there will once again be online surveys to fill out. The timeline for surveys will be very tight: the survey will close Thursday, June 15, at 1:00am. I assume this is because the Board will make a decision about the search soon after the candidates depart. The link for the surveys will be distributed later–I’ll flag it here once I have it. CVs of all candidates can be found here: http://chancellor.siu.edu/search/chancellor/index.php. I would assume (and hope) that survey results will go directly to the Board, which has essentially taken over the role of the search committee. I would therefore urge you to attend these forums if you can, view them online if you cannot, and fill out the surveys. It is vital that the Board get informed feedback from faculty on campus, even during this awkward and hasty summer search. Meanwhile, in Springfield signs of progress are not particularly evident as the regular legislative session stumbles toward its conclusion on May 30. The Senate has passed a tax increase bill, but by a party line vote that invites and could not override a veto from Rauner. 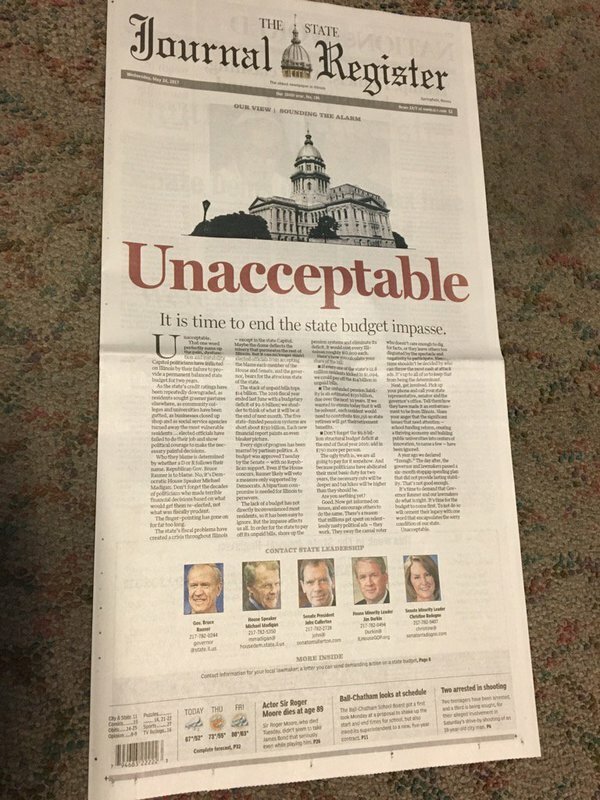 The Springfield State Journal Register is doing its part, and suggesting readers contact their public officials, and even providing a template for a note. Not a bad idea. If you aren’t sure just what legislative district you live in, you can find that information here. Let our representatives know that they need to act to save this university.